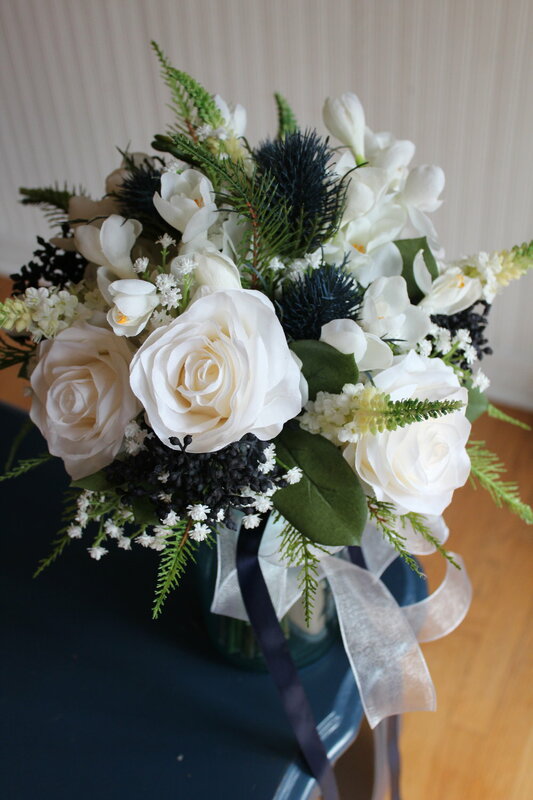 You can't go wrong with ivory and white flowers in your silk wedding flower bouquets. Toss in some greenery and you've got a versatile design that could do any season and still look great. Peonies, Roses, Baby's Breath and Ficus leaves are the perfect combination for classic wedding flowers. 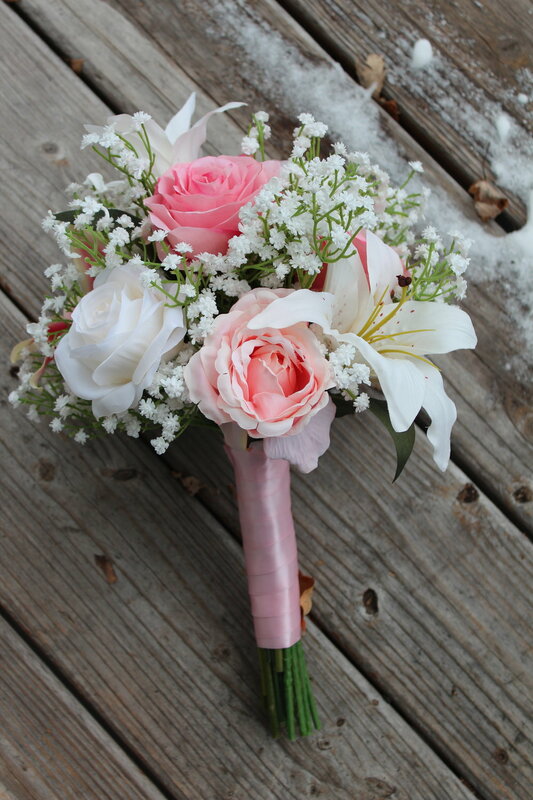 The bridesmaid bouquets were smaller versions of the bridal. 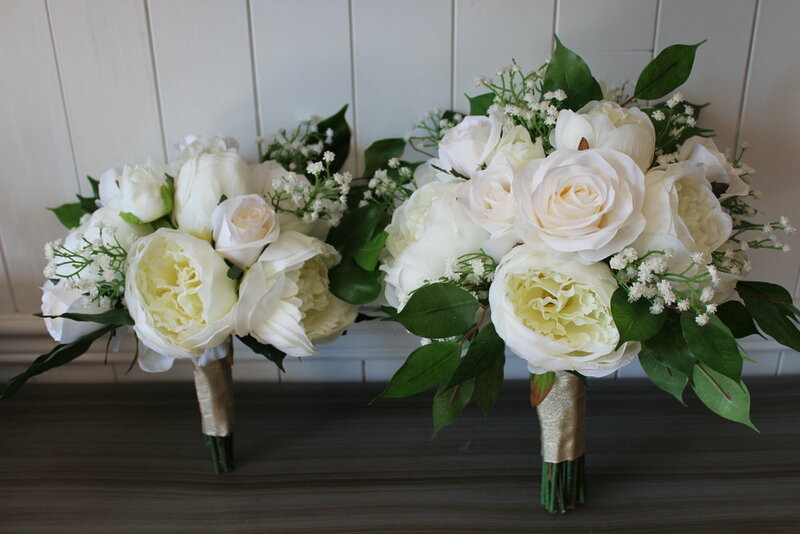 These looser hand tied style bouquets are a little less formal style and great for any wedding venue. Deanna made this order completely on behalf of her daughter. It was a seamless process from design, to creation, to finish! She was able to relay our ideas to her daughter who gave some feedback before the official thumbs up on her designs. We tied everything off with a slightly shimmery gold ribbon for her August wedding. Whether you know exactly what you want, or maybe you are ordering on behalf of someone else, silk wedding flowers are a great option because you get a say in how it all comes together. 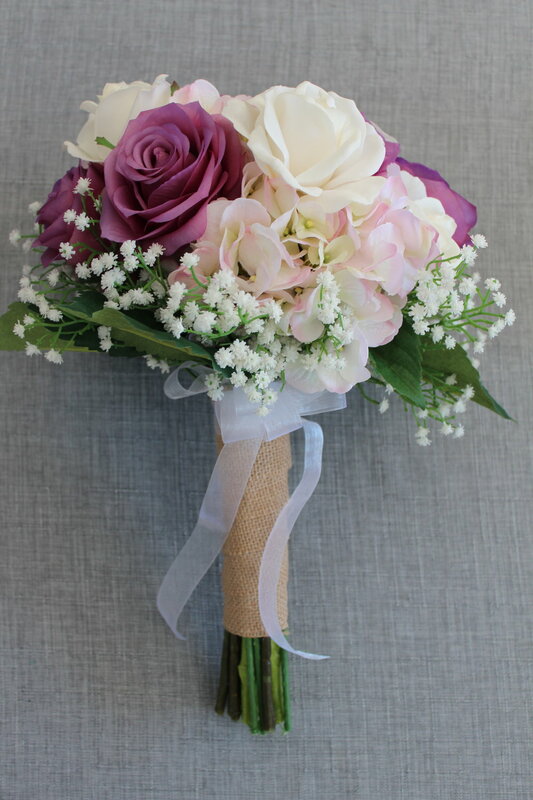 Custom silk wedding flowers are great for so many reasons and the best part is that Deanna will have these flowers in hand, weeks before her daughter walks down the aisle. She knows what they look like and there are no flower surprises on such a big day. 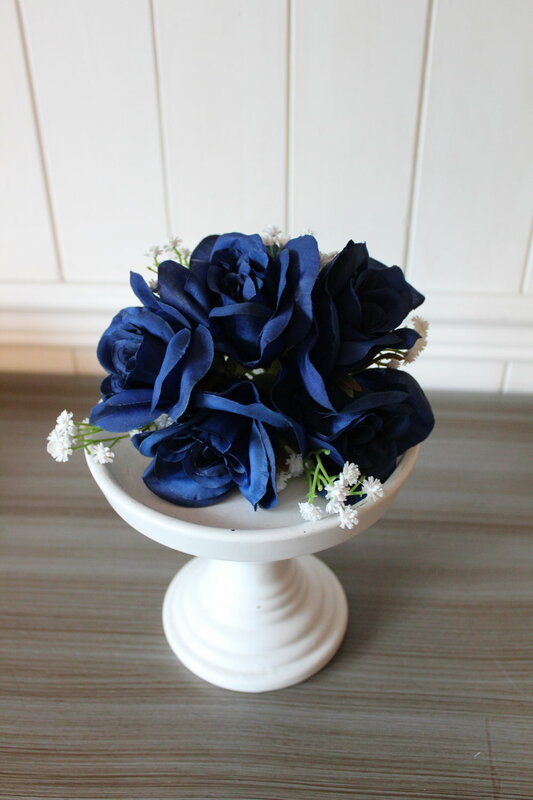 If you are considering silk flowers for your wedding, request a free quote today! Last week I was in major production mode, which means I'm cranking out flowers (count is at 3 weddings and 3 recreations) like it's my job! Because, well, it is my job:) I'm loving the variety of colors, textures, and styles! In the last week and a half, I've done blushes, purples, blues, whites, and cascading, round and loose style garden bouquets. And all were done in high quality silk wedding flowers. This set of silk wedding bouquets are some of my favorites for spring! 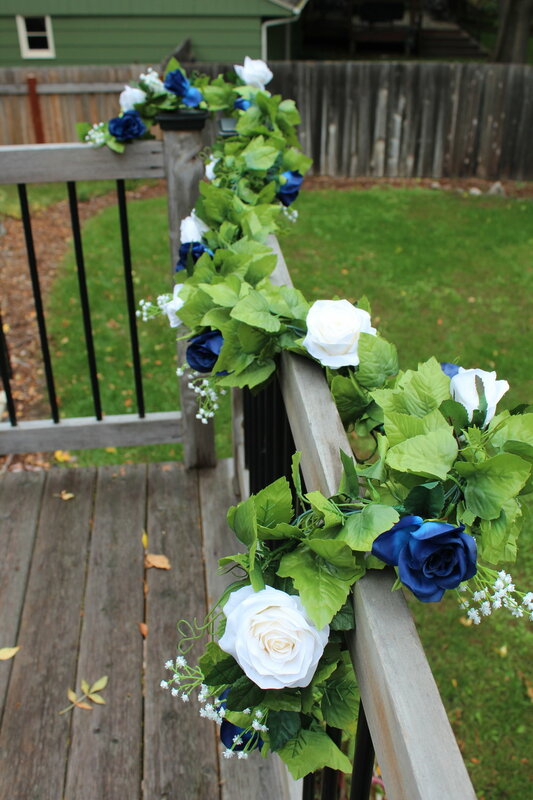 It's for a local May wedding which is only a few weeks off, but I was able to get some pictures of them outside before it snowed again (and again!). I was feeling inspired to share them with you as we all sit here waiting for real spring to show up. The bridal bouquet is a mix of peonies, dahlias, roses, lavender, baby's breath, lamb's ear and eucalyptus, dried gomphrena, and some berries. Perfect for a late spring soiree! 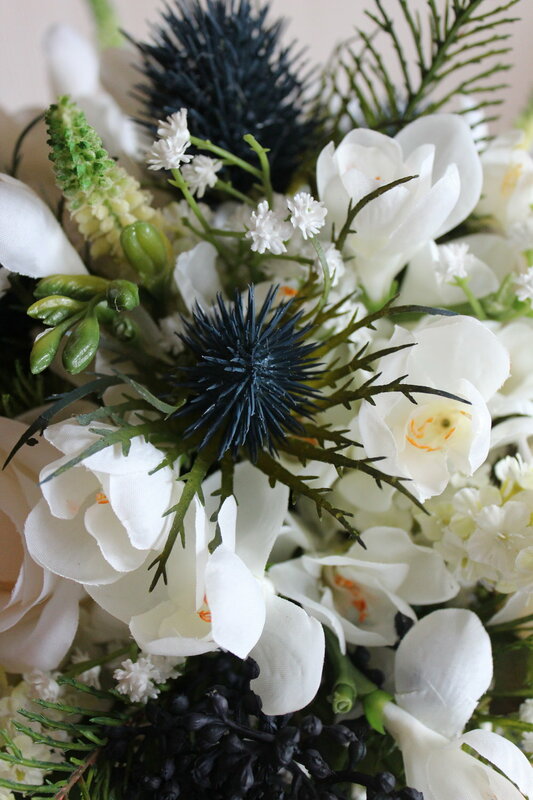 The bride initially order a bridal bouquet and groom's boutonniere. But her family jumped in and were ready to help her round out her flowers with a couple of matching silk bridesmaid bouquets along with boutonnieres and corsages for the groomsmen, parents and grandparents. 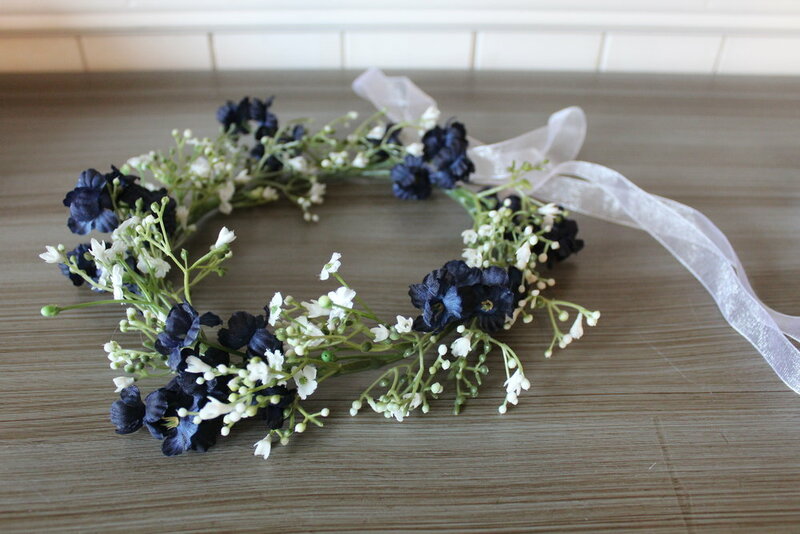 We kept things light and airy for the bridesmaids: lavender and baby's breath with some lamb's ear. 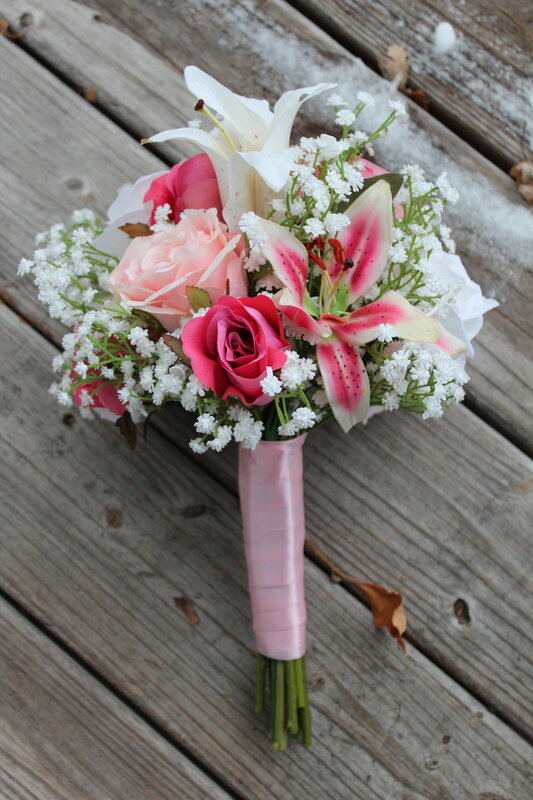 The perfect compliment to her bridal bouquet! Groom's boutonniere, Groomsman's boutonniere, Mother's corsage. Maybe this snow has you excited about your upcoming winter wedding. Whatever the season, silk wedding flowers are always a great option! Fill out the Free Bride's Checklist today to start the conversation about how to bring your floral vision to life! Andreas just seems to be one of those guys who cherishes his wife. I mean he was already planning for an awesome 1st anniversary by having his wife's bridal bouquet recreated. She sure is lucky! Whether you are looking for a 1 year anniversary gift or maybe it's your 50th anniversary, you can't go wrong by gifting her a piece of her wedding day memories! 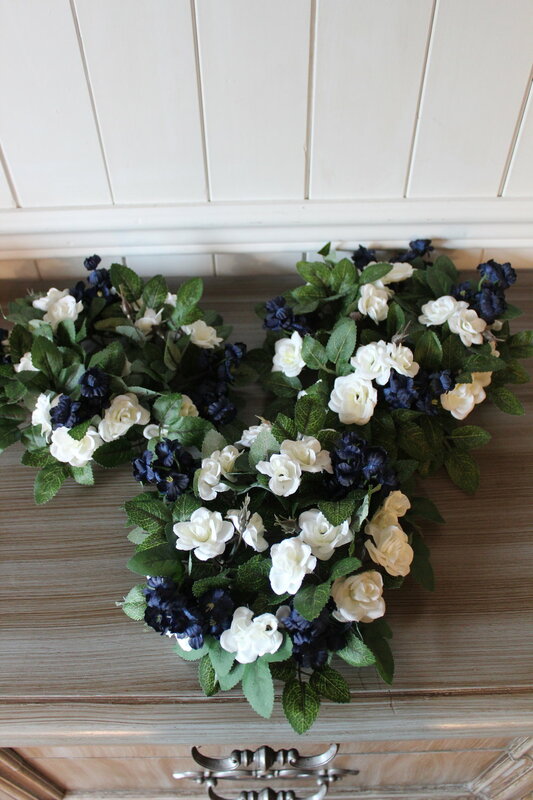 Cream Roses, Lavender Roses, Mauve Hydrangea, Baby's Breath, Hydrangea Leaves, Burlap and Ribbon. Here's a photo of the happy couple on their big day! Don't they look so happy?? 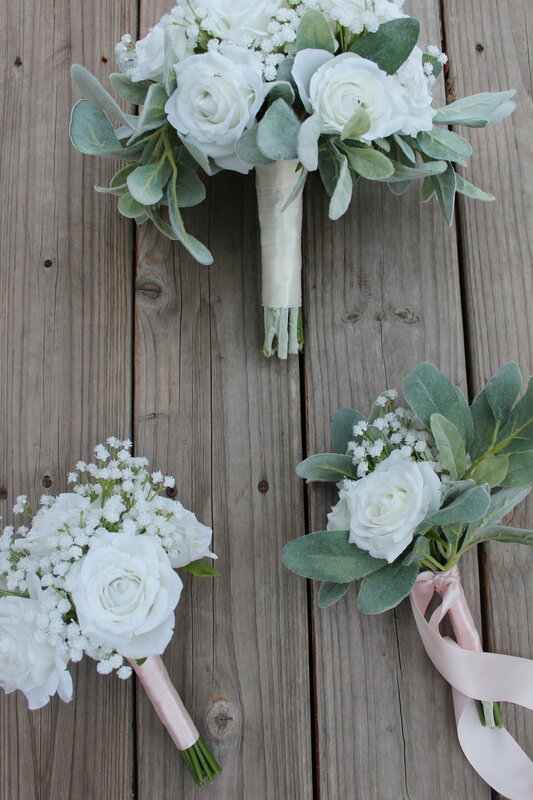 If you are interested in having a bridal bouquet recreated in silk flowers in Minneapolis, California (like Andreas) or beyond, contact me now to get started! 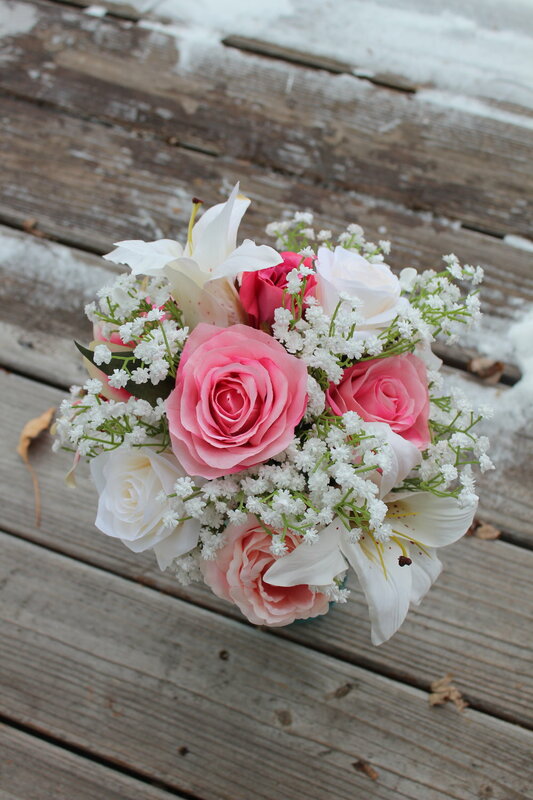 Bridesmaid and Toss bouquets tied off with blush pink ribbon. If you have a white wedding in mind, fill out the Free Bride's Checklist to get a quote! I like a good challenge and I'm competitive. So when Andrew contacted me about recreating his wife's bridal bouquet in silk flowers and said he understood if I couldn't get it done before his November 20th anniversary, I mentally told him, "Challenge accepted." Then I wrote him a polite email about how I was going to make it happen. Here's a side-by-side comparison. 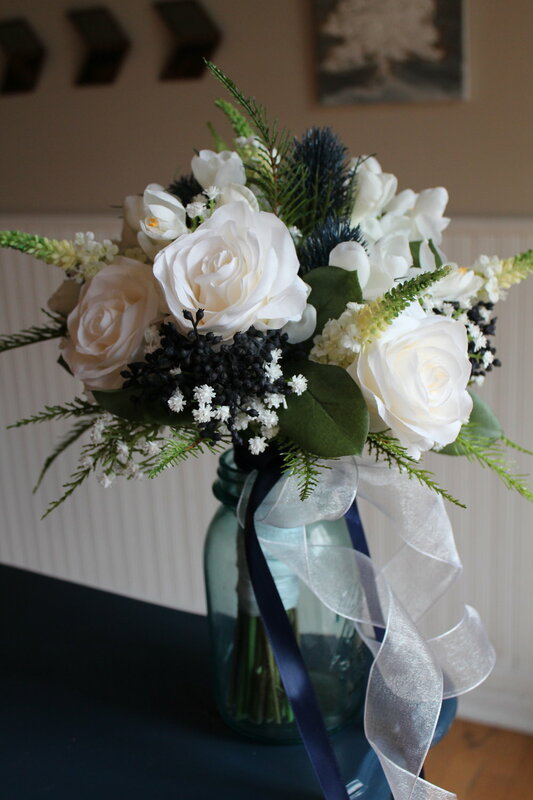 Bridal Bouquet Recreation (left) and original (right). Original bouquet photo provided by: Kaley Martin Film + Photo (on Facebook) or www.kaleymartinphoto.com.